Staple Guns for Fastening Wire and Cable | Acme Staple Company, Inc.
Staplers Designed with the Pro in Mind. Acme Staplers are designed and built to operate in professional environments with custom features that make them highly cost effective, durable, and easy to use. Our patented AC systems meet all broadband wire manufacturers’ requirements. They are the preferred staplers of virtually all major telephone, cable, and dish companies and their contractors. Other uses include security system installers and electricians. Acme staplers are also used at leading structured wiring installation training organizations. 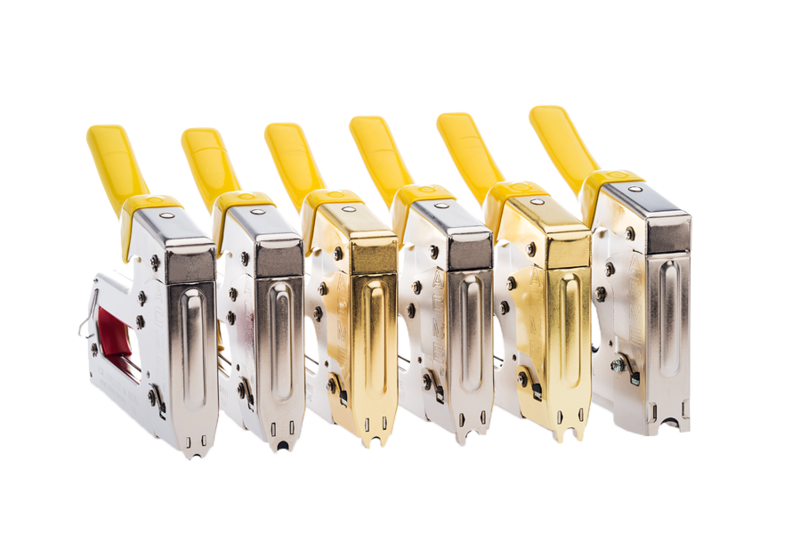 Only Acme staple guns feature high-visibility safety yellow “Sure-Grip” handles, with integral hand-stop for maximum comfort and safety. If it’s an Acme gun, we’ll stand behind it with a limited lifetime warranty. 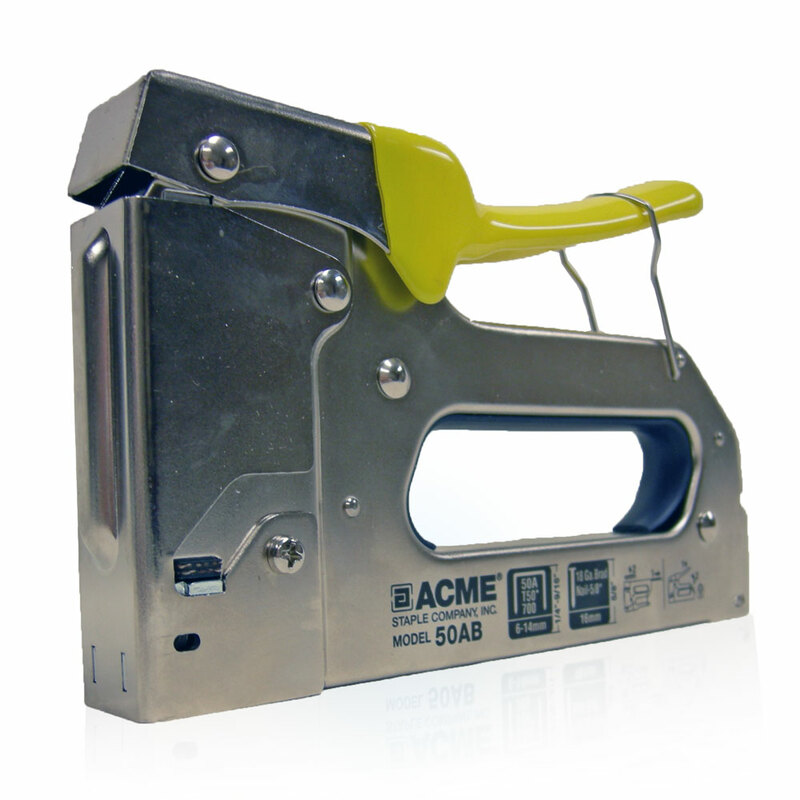 Our unique loading system makes Acme staple guns faster, safer, and more reliable than other brands. Acme’s patented AC models design won’t crush wire or cable, thus preserving their high-speed capacity transmission properties. 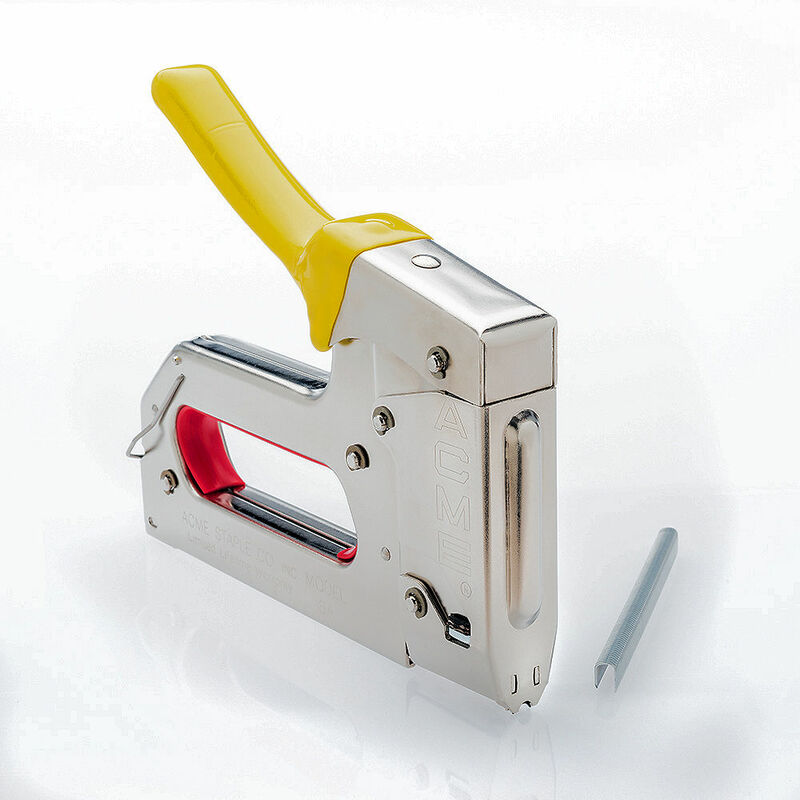 The 18A Stapler is designed for rapid and secure installation of cables up to 3/16″ (5mm). Available in leg lengths of 3/8″ (9mm) and 7/16″ (11mm). 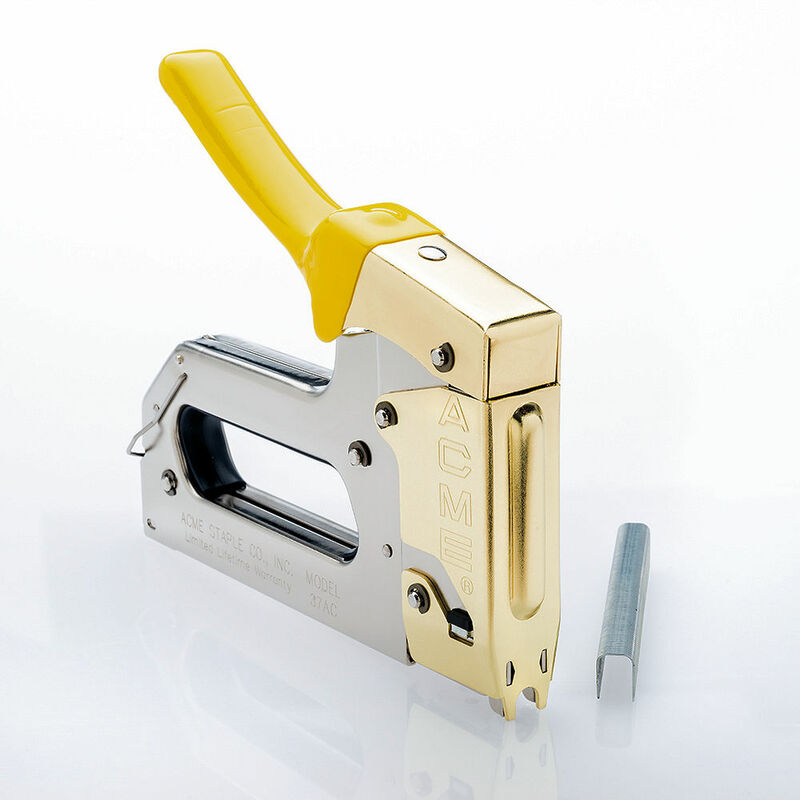 The 25A Tacker Stapler is designed for rapid and secure installation of cables up to 1/4″ (6mm). Available in leg lengths of 9/32″ (7mm), 3/8″ (9mm), 7/16″ (11mm) and 9/16″ (14mm). 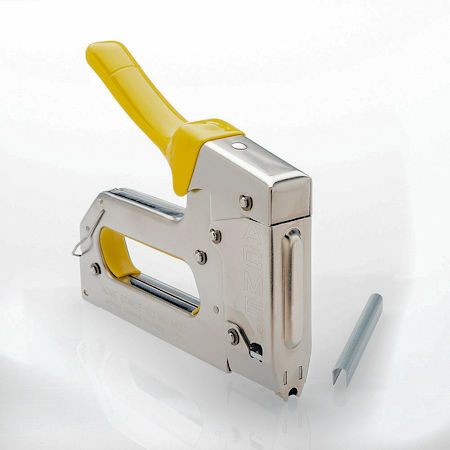 The 25AC Stapler uses our patented design to drive the specially designed staples to a predetermined depth, thus making it virtually impossible to crush broadband wires, such as Cat5, Cat5e, Cat6, Coax RG6, and Coax RG6-TRI, thereby preserving their high speed data transmission properties. This anti-crush objective is accomplished by the interaction of several of the gun’s components with the wire or cable being installed to automatically regulate depth to which each staple is driven. 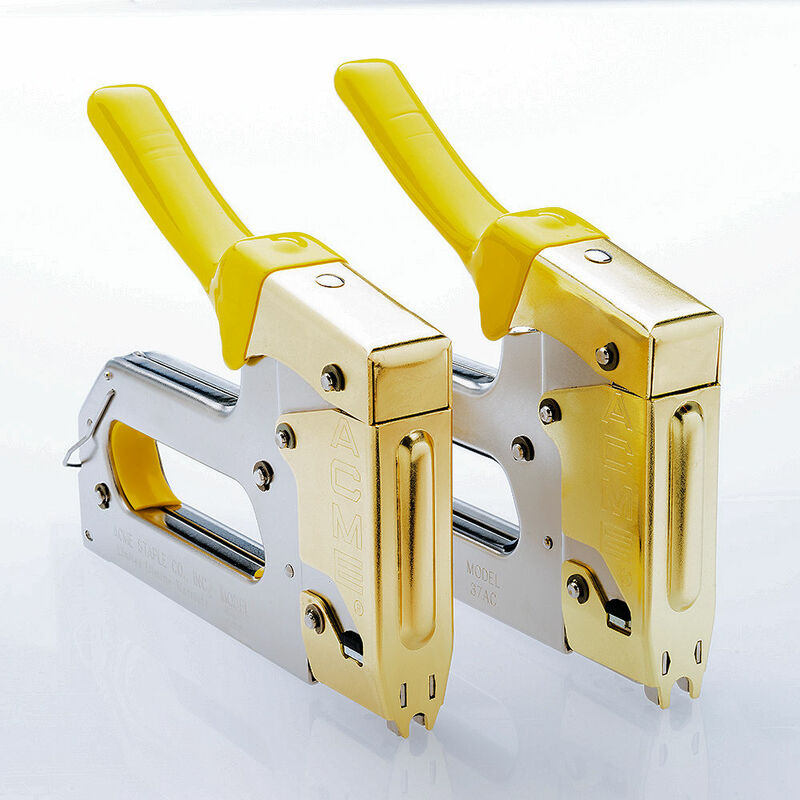 The 25AC is used to install staples over cables up to 1/4″ (6mm). Available leg length is 19/32″ (15mm). 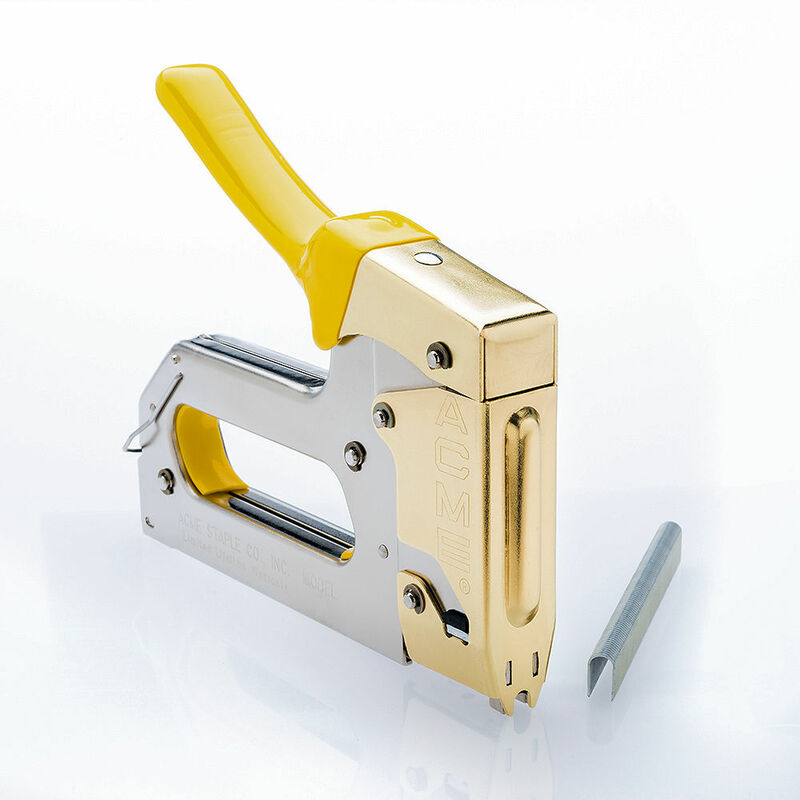 The 37A Stapler is designed for rapid and secure installation of cables up to 3/8″ (9mm). Available leg lengths are 3/8″ (9mm), 1/2″ (13mm) and 9/16″ (14mm). The 37AC Tacker Stapler uses our patented design to drive the specially designed staples to a predetermined, thus making it virtually impossible to crush broadband wires, such as Coax RG59, COAX RG6-TRI, and RG6-Quad, thereby preserving their high speed data transmission properties. This anti-crush objective is accomplished by the interaction of several of the gun’s components with the wire or cable being installed to automatically regulate the depth to which each staple is driven. The 37AC is used to install staples over cables up to 11/32″ (9mm). Available leg length is 19/32″ (15mm). The 50AB is Acme’s heavy-duty, general-purpose tacker staple gun/bradder, now redesigned with the professional in mind. The 50AB features high­visibility, “Sure-Grip” handles with an integral hand-stop for maximum comfort and safety. The bottom-load magazine makes for fast and easy staple reloading and the nickel-plated construction makes the gun virtually indestructible. Available leg lengths are 1/4″ (6mm), 5/16″ (8mm), 3/8″ (10mm), 1/2” (12mm), 9/16″ (14mm). The 50AB Staple Gun also accepts 18 gauge x 5/8” brads, Arrow®T-50 and other compatible major staple brands. 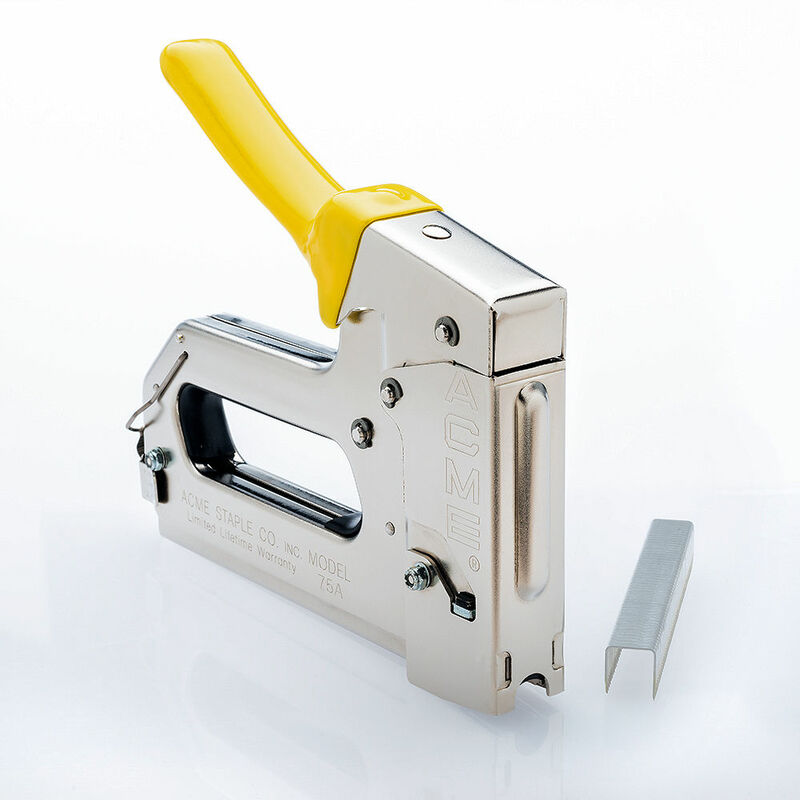 The 75A Tacker Stapler is designed for rapid and secure installation of staples over electrical wire cables of up to 1/2″ (13mm), including standard NM-Building wires (e.g., Romex®*). Available leg lengths are 9/16″ (14mm), 5/8″ (16mm) and 7/8″ (22mm). UL listed staples are available in 5/8″ and 7/8″. Don’t limit your broadband effectiveness with the wrong fastening system. The patented Acme 25AC and 37AC staplers were designed to not crimp or crush Cat5, 5e, 6 and RG6, RG6-TRI and RG6-QUAD broadband wires and cables thus preserving their high-speed data transmission properties. This anti-crush objective is accomplished by the interaction of several of the gun’s components with the wire or cable to automatically regulate the depth to which each staple is driven.